Kaleidoscope Camera is an iPhone app that will turn your iPhone's camera into a machine that transforms your environment into a geometric work of art. We usually only think of using the iPhone's camera for taking photos and recording video, so it's cool to find another fun use for it. Kaleidoscope Camera is actually a very basic app. All of the UI elements appear on a single screen. When you open the app, the camera is immediately put to work and the geometric video immediately starts. In the corner, you'll see a little box that shows what your camera is actually looking at with a white triangle spinning inside of it. This area inside the triangle is the area that Kaleidoscope Camera is actually using to produce the image. Tapping the main view will toggle preview on and off. If you were using a physical kaleidoscope, you would spin it around while holding it up to your eye to watch the shapes spin and change. 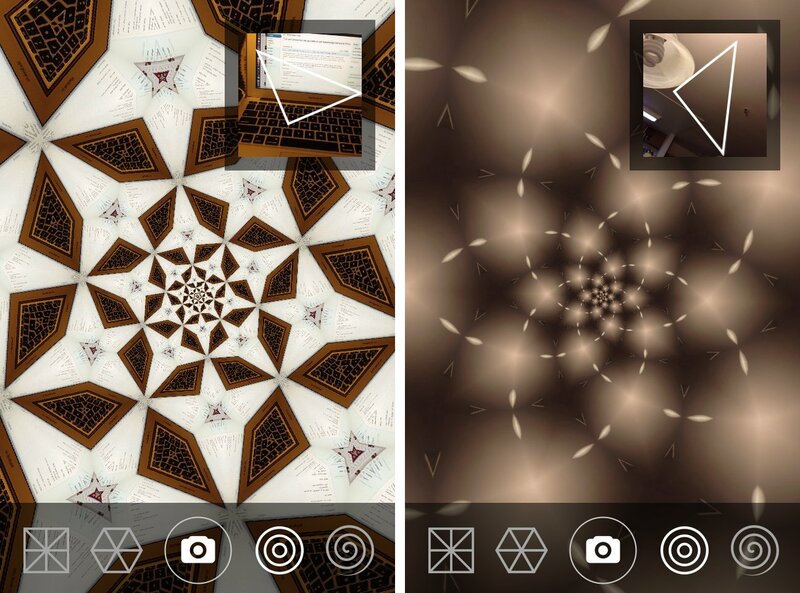 To mimic this effect with Kaleidoscope Camera, you simply use your finger to "spin" the camera. You have control of the speed and the zoom. On the bottom of the screen, you'll see the four different modes and a camera button. Tapping the camera will capture a still shot of what you currently see on the screen and pop up a menu to save to your Camera Roll or to send to Facebook, Twitter, or email. I was very impressed that even at night with only one light on in my living room, Kaleidoscope Camera was still able to produce great results. Kaleidoscope Camera reminds me the days of being a kid and running around playing with a cheap $1 kaleidoscope -- only it's better.